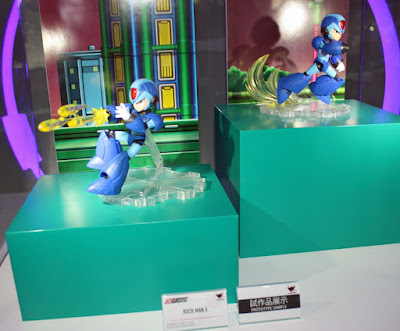 Damnit Megaman is starting to feel cheap with how many figure companies get their hands on the license! I am going to have to put my foot down and unless they make something I don't have in another line (Or even two of in another line!) I am not going to buy this. I wish D-Arts got to Protoman, or this 4 inch nel line got to him. This still great news that Capcom is keeping Mega Man, (Rockman) alive by licensing it out to all of these companies. If there are no figures released less people talk about it and when less people talk about it the IP slowly dies. While we are on the subject I think Capcom should release a new big budget Mega Man game and bundle it with a figure, which ever one is best selling at the time. That way they could hit two markets at the same time in half of the time. I mean, X is great and all, but did we really need another one? We have the cruddy Jazwares action figures, the great S. H. Figuarts figures, the amazing Tru-Force figure, the impressive 4-Inch Nel figure, the good Tamashii Buddies figurine, the intriguing 66-Action figure, and now an NXEDGE? Even though he's a great character from a great series, spice it up a bit. Legends and Battle Network have been given some long-awaited attention recently, so give us some ZX love - and even though I don't care about it as much as the other lines, give Star Force fans a bone. For some reason I think Star Force Mega Man fits more in with mecha, but I can't tell why. Must be his suit or something. Uh..... More people played battle network on average than MMX most likely. Order of most sold MM series from most to least and logically most played. SO yeah Star Force for its time was the healthiest MM series in terms of popularity. This is for individual titles but it tells you which series have been financially viable: Classic, X and BN. If you want me to find it, I have the Media Create sales data for all three SF titles. But off hand I can tell you the series as a whole is pretty far away from a million units. SF1 was the only game to do "well." I think something was lost in this. I was saying it in terms of knowledge not sales. Most have heard about the others and only some have really played them. Not to say there aren't fans/sales just most people stopped playing around x or so. Capcom's platinum title list doesn't include just below platinum or let alone half a million. In Japan alone not including worldwide releases tallying all three entries by the end of their first year, in sales for the SF series a total of exactly 1,060,063 units. But that is from all the known sources I could find, so yeah I would like the Media Create data. I know ZX series sold terrible heck Capcom pretty much outright preemptively stated that is what killed the series, to the point of begging people to buy them if they want to see them continued. But considering Mega Man fatigue, steep 2D platforming competition, and the looming stigma of sprite based Mega Man looking like more of the same with no innovation... ZX did its best. Or the negative stigma around 2D action side scrolling games in general, you think the amazing Castlevania trilogy or Contra4 did much better? Enterbrain/Famitsu has SF1 (Leo, Peg, Drag) at 593,675 by 2007 year end. US/PAL sales data is unavailable. Media Create sales data is out there but I don't have the time ATM to dig through it. Well that pretty much corroborates my sources since those are the approximate (with the only variance being the SF2 sales) figures I used to get the series unit sales total in Japan alone. So yeah, that along with the undoubtedly tens of if not maybe even hundreds of thousands unit sales worldwide, the series isn't far away from hitting a million units, if anything it has thousands to spare while still reaching over a million units of total lifetime sales. Wait, straight from the Wonder Festival floor? How? The festival isn't till a week from now? Sneek peek pic or something? But looks cool and all, but what is annoying me a bit is all the unnecessary panel lines. Also I find it odd that they added a type of dash effect part, yet X can't dash in X1 (noted by the background) till you get the boots of the Full Armor. They screwed up there! lol! Yeah, great save protodude. Your welcome on pointing out that its not from the Wonder Festival. Bandai should make a MM game, they basically spent enough resources on the brand over the years to fund a MM game anyway. I mean a new game. Blast effect parts: d-arts. Dash effect parts/slightly chibi: 66-Action. Size: 4" nel. Armor design: tru-force-esque. Agreed we need more variation in figures. I see a lot of comments for ZX and Starforce, but I personally would want something more than just main-character merch... Like a pack of special weapon effects parts for my 4" nel rockman / X (like they did for EXE but MORE/just weapons). Or some enemy figures other than mets--some kind of stage diorama with mini enemy figures would be cool... Or a 66-Action set of bosses. Nice! This one looks pretty cool. It feels like the Mega Man X 25th anniversary is being celebrated early. I love the extra detail in the armor. Between this, the novel, and getting top billing in MVCI, X is looking to have an eventful quarter this year at least. It doesn't look like Capcom of Japan is going to put any money into the Rockman franchise, but they are sure enough trying to get money out of it. This gonna go nowhere, sadly. Sentinel's already killing it with their 4 inch series, and this thing is just fugly. I want a poseable Sigma, dangit! Show me the Sigma! This will be a nice addition to my other NXEDGE figures. I don't care what anybody else says. Not only do I not care for Tommycase, but the game itself looks so tryhard but no results. Also a lot of the premise, stretch goals and stuff isn't pushing me over the edge. Now the MMXC team needs a kickstarter raise, but their butts are doing everything from scratch for free. They are even now redrawing all the sprites to be original to their project.